Thank you everyone for attending and supporting our most successful Spaghetti Dinner on record! We had in excess of $32,000 in sponsors, $990 in raffle drawings and sold over 878 tickets! Thanks everyone for their support. 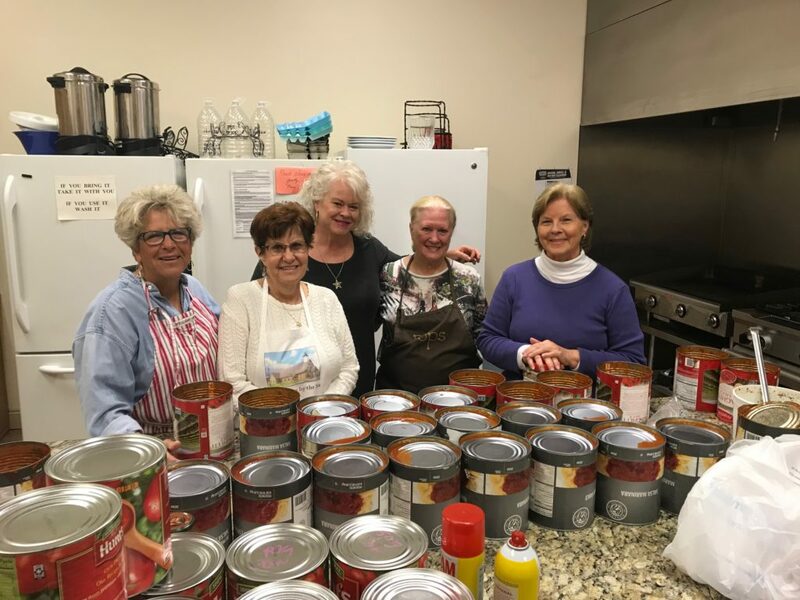 The Christian Service Center will host their annual spaghetti dinner on February 26, 2019. The dinner will be served at the Gulf Shores United Methodist Church, Building B, from 4:30 – 7:00 PM. Dine-in and drive-through service will be available, along with vegetarian and gluten free options. The $10 tickets are available at the Christian Service Center, 317 Dolphin Avenue, Monday through Friday, 9 AM – Noon, and at the Gulf Shores United Methodist Church Coffee Shop and at the door. LAND DONATION FROM THE ERIE MEYER CHARITABLE FUND, INC.
Presenting and receiving the land gift are: Neil Johnston, Erie Meyer Charitable Fund; Linda Chappelle, CSC Director; Stan Moss, CSC Food Pantry Chairman; Kenneth Niemeyer and Herb Malone, Erie Meyer Charitable Fund. 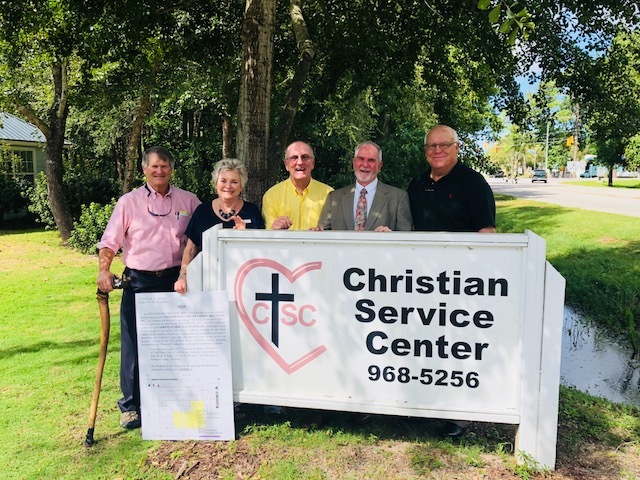 The Erie Meyer Charitable Fund, Inc. has very generously given the Christian Service Center the property adjoining their current space at 317 Dolphin Way in Gulf Shores. The gift is shown as the shaded area in the pictured parcel view. The Center’s original property was also a gift from the Erie Meyer Fund in 1998, allowing us to build our first permanent home. 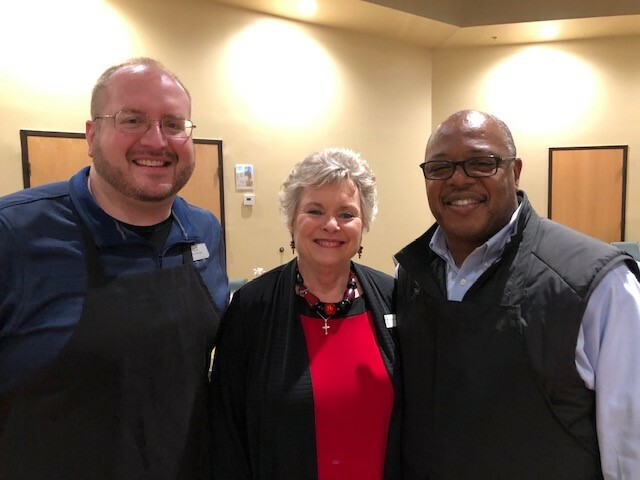 The Erie Meyer Charitable Fund has been a vital part of the development and operation of the Christian Service Center since the Center began in 1991. The vision for the future use of the new property is to add much needed additional parking, and to construct a large all-purpose building so that the Center can expand our services and improve our ability to serve the community. The Christian Service Center is a “Hand Up” rather than a “Hand Out” agency. Clients are given immediate emergency aid as well as guidance on finding solutions to their problems. 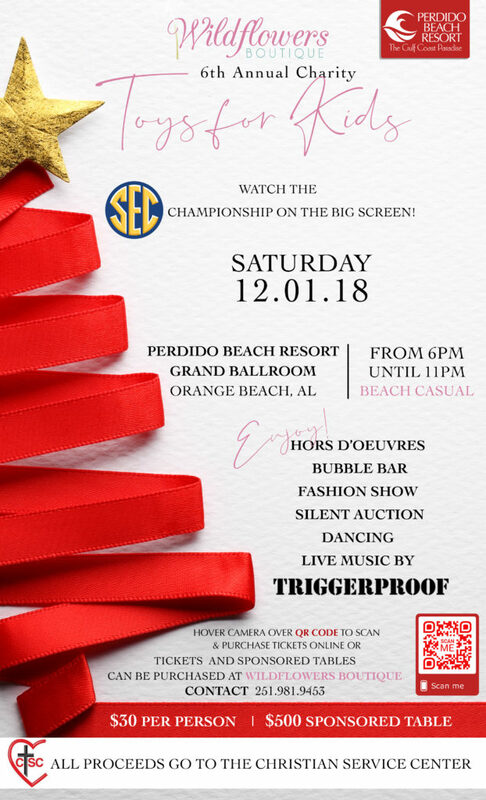 The CSC is a 100% volunteer agency funded by the churches of Pleasure Island, various community organizations, including the United Way of Baldwin County, and interested individuals. For more information please call the CSC at 251-968-5256 or visit www.cscgs.com.